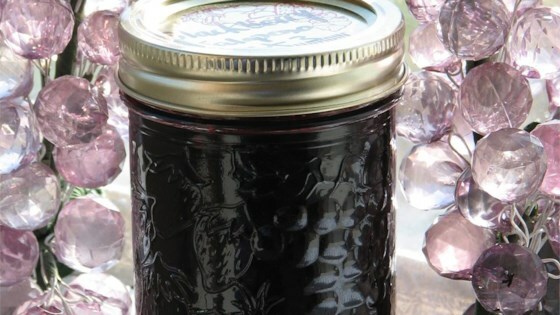 "I googled all the sites looking for a blackberry jalapeno jelly, to NO avail; all I could find was everyone looking for this recipe. Well...I spent the weekend creating my own. Darn good, quick, and EASY! Goes great on crackers with cream cheese. Sweet with a warm bite! MMMM! I picked a bowl blackberries, put them through my juicer, then froze juice until I was ready. If you want burning hot, add one more pepper. ENJOY!" Mix the pectin crystals with 1/2 cup sugar in a bowl. Stir the blackberry juice, pectin mixture, green jalapeno, and red jalapeno together in a saucepan; bring the mixture to a boil for 1 full minute. Add the 3 1/2 cups sugar and return to a rolling boil until the sugar has fully dissolved, about 1 minute. Remove from heat; stir while off heat to remove bubbles and foam for about 5 minutes. When I made this recipe and it turned out great. Instead of juicing the berries, though, I pureed them and strained out the seeds. It set up great. It was SO good!!! A must. I might add a extra jalapeño next time, we like spicy food.